San Diego lifeguards planned to resume the search Monday morning for a man who fell off Crystal Pier in Pacific Beach and was never seen resurfacing. 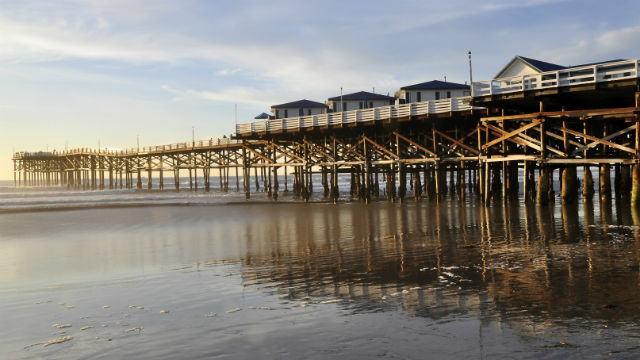 Lifeguards from the San Diego Fire-Rescue Department launched the search about 5:30 p.m. Sunday when witnesses reported that a fully clothed, 27-year-old man fell off the pier and may have hit his head on the way down, Fire-Rescue spokeswoman Monica Munoz said. None of the witnesses saw the man resurface after he hit the water. A lifeguard immediately jumped into the water from the pier and was soon joined in the search by a lifeguard boat, a smaller personal watercraft operated by a lifeguard and a helicopter helping to light the area and search for the man from above, Munoz said. Emergency crews also searched the water from the pier above, and at one point 16 lifeguard swimmers were in the water searching for the man under the pier’s pilings and in the open water. Waves were 4 to 6 feet Sunday with strong rip currents in the area. Lifeguards eventually called off their search around 7 p.m., around the same time a U.S. Coast Guard helicopter and boat began searching, Munoz said. Lifeguards planned to rejoin the search around 6 a.m.